In 1902 Stephen S. Mann and Frank A. Parker formed a partnership and operated as lumber wholesalers in Baltimore, Maryland. In 1913 the firm was incorporated as The Mann & Parker Lumber Company. In 1920 the company purchased land on the Baltimore waterfront and started a hardwood distribution center. 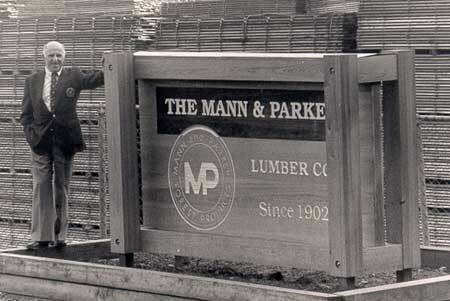 Robert R. Bushman Sr. purchased The Mann & Parker Lumber Company from the Mann & Parker family estate as of July 1, 1956 and became President & General Manager. The company continued to operate as a wholesale hardwood distribution center and has grown from five employees to its current number of employees today. The company is recognized as a leader in the hardwood lumber industry. 1964, the company started a dry kiln operation in Cockeysville, Maryland. On New Year’s Eve, 1969 the entire Baltimore plant located on the Baltimore waterfront was destroyed by fire. Headquarters were moved to the company’s dry kiln center in Cockeysville, Maryland as of January 1, 1970. In 1970, the company purchased land in New Freedom, Pennsylvania. In 1971, construction of a new hardwood distribution center and dry kiln operation was started in New Freedom. Headquarters for the company were moved to New Freedom in April 1972. The Cockeysville Dry Kiln Center was severely damaged by a flood caused by Hurricane Agnes in June 1972. By July 1974 the entire operation had been moved from Cockeysville to the New Freedom location. In addition to the company headquarters main office in New Freedom, the New Freedom hardwood distribution center includes: four warehouse buildings; complete modern millwork facilities; one predrier building and nine dry kiln buildings; lumber inspection and automatic stacking and unstacking equipment; and one maintenance building. The New Freedom facility has the capabilities of processing in excess of 18,000,000 board feet of kiln dried lumber annually.